Wis., has been “making things” ever since he was big enough to wield a jackknife. Away back when makers of electric drills offered lathe attachments, Oakes had the yen for power tools. So he started equipping his shop, suffering occasional pangs of guilt over such an “extravagance,” and never dreaming he was laying the foundation for one of the most unusual careers in the U. S.
The Oakes hobby, which has more than justified any expenditures he has made, has brought enjoyment to thousands of persons. Oakes is now “Professor” Oakes, the wizard of Waukesha. Perhaps you have seen some of his weird and imaginative inventions in the movies where they have been featured. Or, you may have encountered the busy inventor in person. 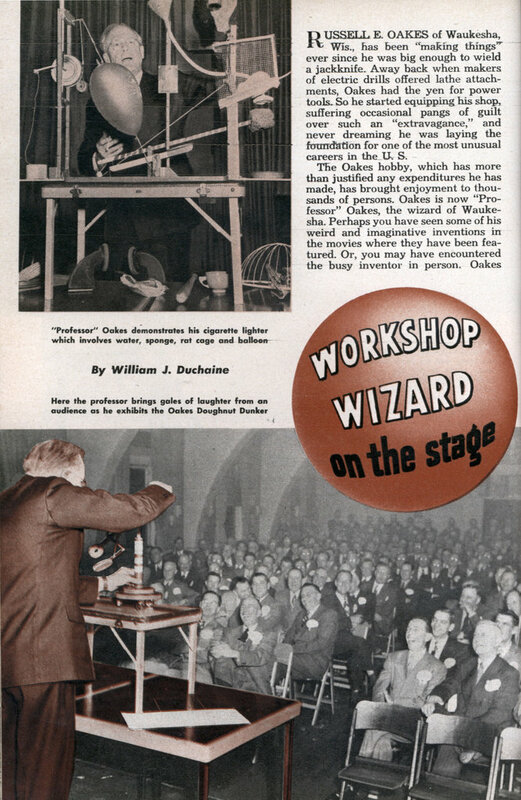 Oakes gives humorous talks and demonstrations of his inventions. Recently his services have been in such demand that his hobby has become his profession. Oakes has some 60-odd inventions to his credit. To call them odd is an understate-ment. He simply calls them goofy gadgets. Oakes served as a writer and idea man with a Milwaukee advertising agency for 17 years. Most of his leisure time he spent in his home workshop. Back in 1935, a friend induced him to demonstrate his mirth-provoking devices at a banquet held for salesmen of a hydraulic-jack manufacturer. Attired in a Prince Albert coat, Oakes began his program with the announcement of his greatest contribution to science. Then he demonstrated his Hydraulic Cigar Lighter. 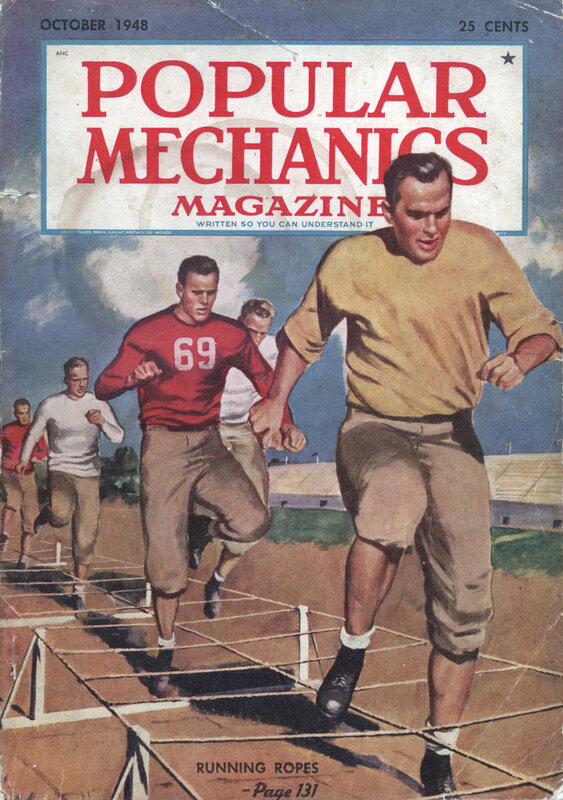 The lighter is a Rube Goldberg mechanism and the hydraulic salesmen got a big kick out of its demonstration. First, Professor Oakes asked for a glass of water. He poured the water into a funnel. The water flowed from the funnel onto a sponge . operating a lever which opened the gate of a rubber rat’s cage, revealing a piece of cheese. When the rat snapped at the cheese, she hit a paddle, operating another lever. This lever punctured a balloon and released a weight which caused a flywheel to revolve. Sandpaper on the flywheel ignited a firing unit. Then, all the professor had to do was to tip up another lever and light his cigarette. Oakes has devised many “labor saving” inventions to make the pastime of eating more enjoyable. He’s particularly proud of his Catsup Getter-Outer. Everyone knows how difficult it is to coax the catsup out of a bottle. With the Oakes Catsup Getter-Outer, you merely place a plate bearing a hamburger sandwich on a special platform. Then you turn a crank and a mit-tened hand does the pounding! The Fresh-Bread Tester is another vitally important invention in the food-handling line. The tester makes it unnecessary for homemakers to squeeze the bread to ascertain its age. They merely insert the bread between two “hands,” and pull a long lever. If the bread is hardened with age, it resists more. Day-old bread flashes an amber light. But if the bread is soft and yielding, the word “Fresh” appearsâ€”and a green light shows it is safe to buy the loaf. Recently, Oakes introduced his “patented” Dripless Doughnut Dunker to a group of men attending a smoker given by the Green Bay (Wis.) Chamber of Commerce. The mechanical dunker dips the delectable morselâ€”either bite by bite or totallyâ€”and holds it for the convenience of the nibbler, while a hinged drip pan catches the coffee overflow and saves the tablecloth. In addition to protecting the tablecloth, the dunker also is a godsend to the diner who likes to dunk but is afraid to scald his thumb and forefinger, Oakes explains. To those worried about the high-cost-of-living bugaboo, Professor Oakes recommends his Sugar Conserver device. It is guaranteed to get more “mileage” out of each lump of sugar by making a single lump serve a family of four. First, the coffee is placed on a turntable. The operator turns a crank, and a cam arrangement lowers the lump into the cup. After two seconds, a bell rings and the sugar is yanked out of the cup. The next cup then moves into position, repeating the action. A dial indicates the number of cups sweetened! Oakes has a unique invention to benefit the type of person who is always patting himself on the back. It’s the mechanical Back Patter. When the man brags into a microphone arrangement, the hot air rises to inflate the “air chamber.” Then by operating a lever the wind turns a paddle wheel, which in turn operates a crank to cause a hand to pat his back in a gratifying fashion. One of the most prolific inventors since the days when Benjamin Franklin flew a kite, Professor Oakes also has “patents” on a Chatter Eliminator. It fits over the head like a radio headset. The rubber pads over the ears help eliminate conversations behind you. Assume you are at the movies. The amplifiers on this gadget face toward the screen so you can hear every endearing term spoken by the movie stars. But if the picture is dull you can reverse the headset and pick up the gossip from behind. The Self-finding Golf Ball is a great boon to golfers who are always slicing the ball into the rough. When it lands in the tall grass, the ball sends up a red flag and blows a horn to indicate its location. For picnickers, there’s the Sandwich Shoosher, a sort of third hand with red fingernails. You merely place the sandwich in the third hand. Then you can drink your coffee in peaceâ€”because waggling the thumb operates a Shoosher, enabling you to shoo flies off your sandwich. There’s also the Sure-Strike Bowling Ball. It overcomes two common problems of all bowlersâ€”getting fingers cramped or stuck in the holes, and eliminating low scores. When you give this ball a heave, an automatic clutch operates, enabling you to keep the finger holes in your hand. When the ball slides down the alley and smacks the first pin, automatic extension bars pop out, doubling the width of the ball and really mown the pins down. For insomnia victims, Professor Oakes has invented his Automatic Sheep Counter. Insomniacs need no longer worry about the sheep who come up to the fence but refuse to jump. The invention counts only those which actually cross the top barâ€” and a mechanical counter keeps tab on the number that do go over and reports them to the sleepless one, until a sufficient quantity to produce sleep have passed over the rail. Even then, the counter keeps on counting, and should you wake, a glance at the automatic total will reassure you and put you back to sleep again. For church collections, the Oakes Collection Box is ideal. A red light flashes for a penny; nickels and dimes are not marked. A quarter produces a green light and the sound of chimes heralds a dollar bill. A button brings a pistol shot. There are many other goofy gadgets that have come out of the home workshop of Russell E. Oakes, the wizard of Waukesha. And there are more to come, for he always finds time to return to his hobby.